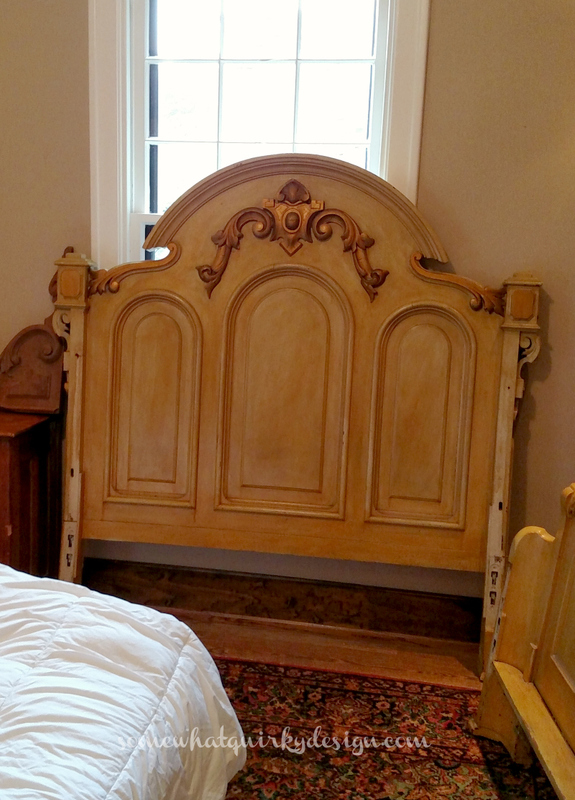 So Duck Egg Dressers client also has a headboard. 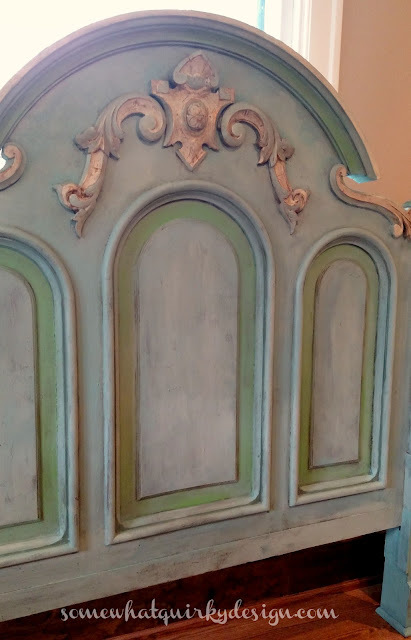 But for now just a headboard. And was once brown - as in some sort of wood finish - I think. Somewhere along the line it got painted like this. It has lots of drippy varnish. But like its roommates it has great bones. I sanded back a bit to see what would happen should I paint and distress. Nobody wants to distress back to slick white. one layer of Masion Blanche in Chocolat. This brown turned out to be pretty red and was going to require another coat. 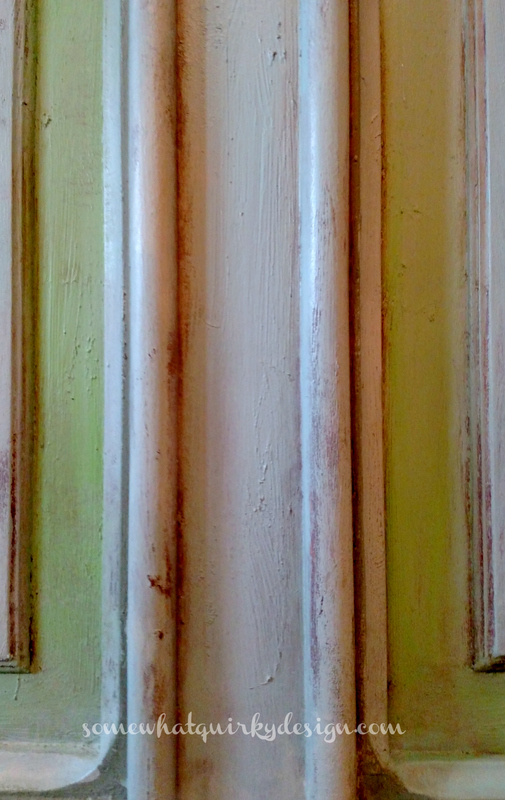 Instead of using this paint again, I switched to Caromal Colors Country Living Textured Basecoat in Chocolate. 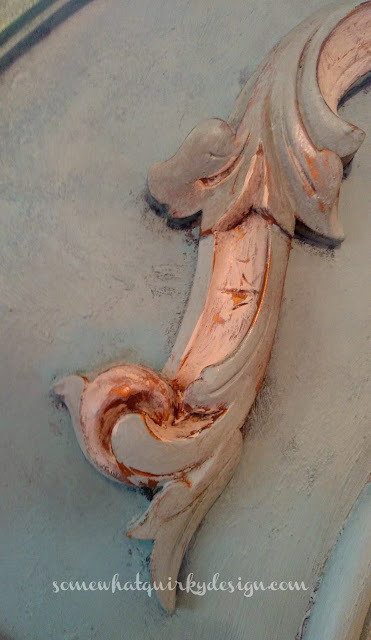 I don't see much about this paint in blogland, so I'm going to take a minute to talk about it. Textured Basecoat is the consistency of peanut butter. You can see a video about it in the above link. The video shows the traditional way to use the paint. I have never used it in the traditional way. I have used it as a medium for a raised stencil (embossing) and use it whenever I want to make a heavily textured background for paint layers. 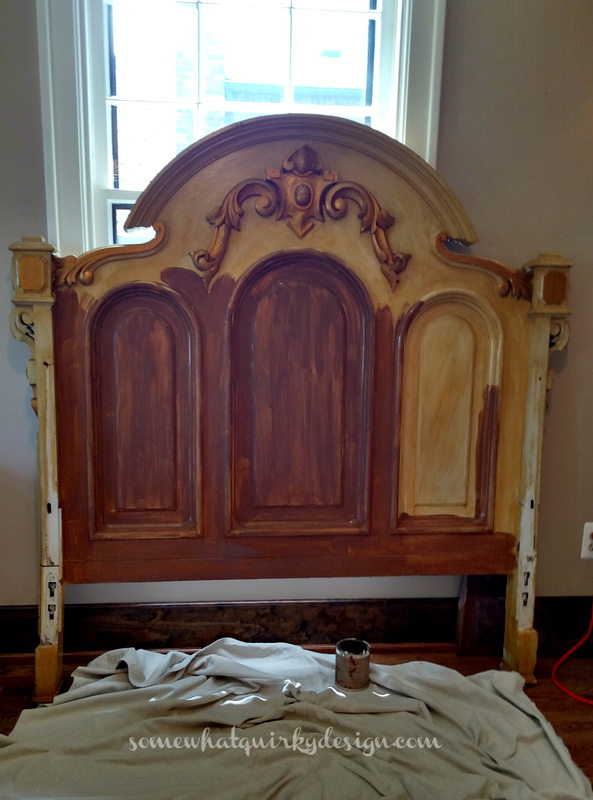 In the case of this headboard, I applied a coat with a chip brush. I used very short strokes, going all directions. Some places I stippled it by just punching it with the brush. When I was done, it just felt like a really bad plaster job. I mean REALLY bad. This was exactly how I wanted it to look. 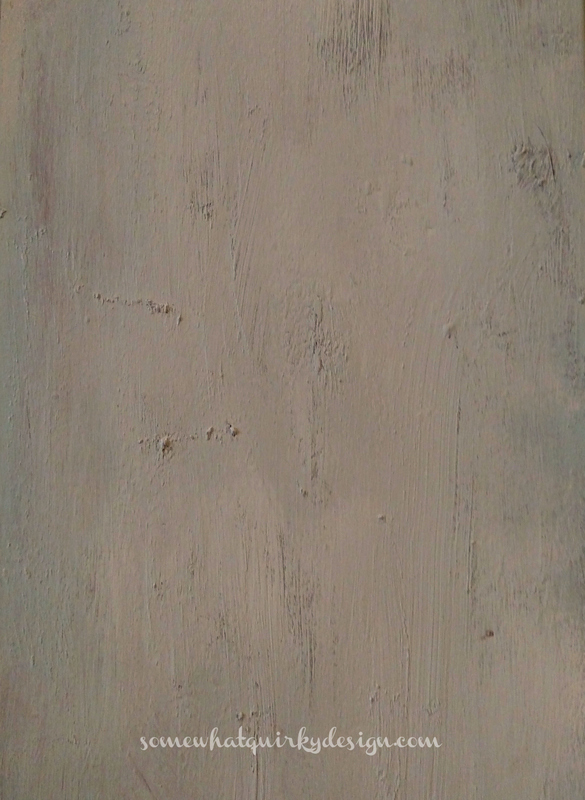 This is what the texture looked like once I was finished painting. I painted 90% of the headboard with Chalk Paint® in Provence and Duck Egg. I used both colors separately and just blended them as I painted. 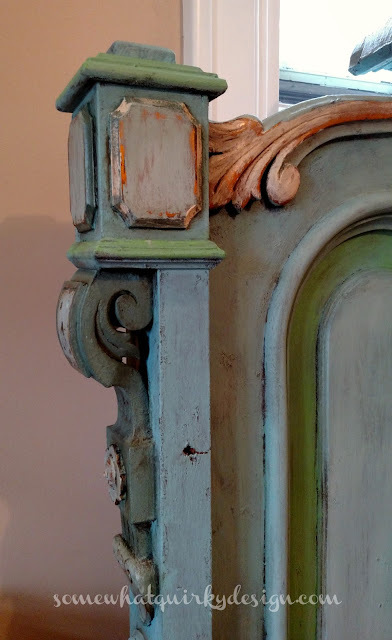 I love using Chalk Paint® with just one color, but man oh man does blending them give you some incredible depth and beautiful color variations. I did not cover anything 100%. 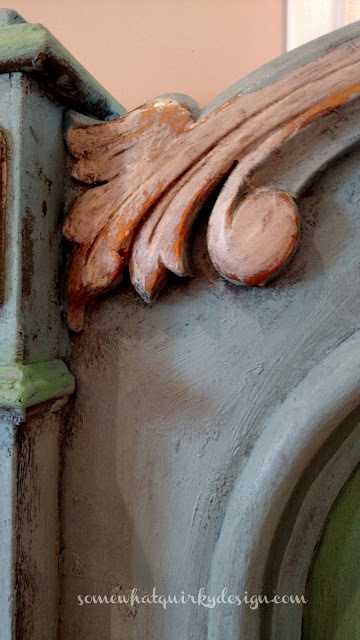 There were tiny places all over the headboard where little bits of the brown base coat showed through (especially in the creases). 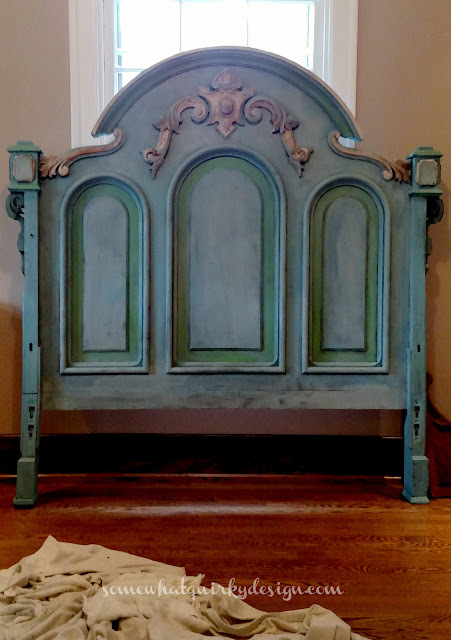 The accent colors I used were also Chalk Paint® in Olive, Old Ochre, Antibe, Duck Egg and Provence. I did not sand it back with sand paper. I did rub down the whole piece with a damp terrycloth wash cloth. On the gold accents, I used the same wash cloth, pressing a bit harder to wipe away paint on the edges. The entire piece was waxed with Annie Sloan Clear Soft Wax. 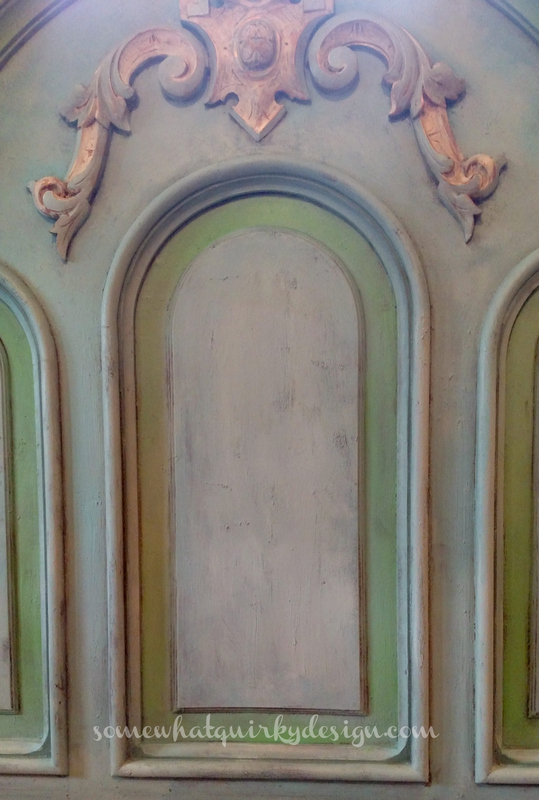 All accents and shadows were then waxed with Annie Sloan Dark Wax. It's magnificent if you ask me. Would you like me to paint your headboard? Would you like to see some more stuff I painted? Go here, here or here. Oh my word! I thought . . .oh she'll paint it white . . . I love what you did, all of those layers of paint and the colors. Work of art. Such depth, love the way the colors change and work together so well. I love it! When you first started out, I was like, "Please paint it white, but voila! It is beautiful. Distressed too. Perfect! I love the blue/green combination...it is my favorite! Such a beautiful job really well done! Such artistry! I love it! You did a fantastic job. I think I possess all the ASCP colors you mentioned. The colors remind me of a strong Mexican influence. It's beautiful. Wow, wow and more wow!!! The previous comment was going to be my comment....WOW!!! This piece is awesome! Love the colors, the texture, the whole thing!! I love all the different colours and techniques you used to accomplish this. Great transformation. This looks so pretty. You did an amazing job!